As a supporting sponsor of the Property Council of Australia’s ANZ/Property Council Survey, RCP is delighted to today be hosting ANZ’s Head of Economics, David Plank at a boardroom luncheon in our Brisbane head office to hear David’s expert opinion on the June quarter survey results and to provide his observations on the economy and the Australian property sector, with a particular focus on Queensland. The June quarter survey results, recorded from over 1,000 property industry respondents, have been released today and RCP is looking forward to gaining David Plank’s insight in relation to these latest results. Additionally, we are pleased to offer below our own commentary and market observations in relation to the June quarter results. All markets have recorded an encouraging increase in overall sentiment this quarter and we are beginning to observe a narrowing of the gap in confidence between states. Additionally, the survey results demonstrate an uplift in forward work expectations resulting from strong national economic growth expectations. South Australia this quarter recorded the highest level of confidence across all states. This result is consistent with project activity at RCP, with the RCP Adelaide team recording a surge in recent new project activity including the Pullman Hotel refurbishment, AusPac Group’s Sturt Street mixed use development, Loxton And Waikerie Council sport centre and RMBL Investments 250 East Terrace. Queensland has also recorded a strong shift in positivity for the quarter and RCP continues to experience strong project demand with our most recent project of note being the management of the recent lodgement of the development application for Charter Hall’s proposed 40,000m² 360 Queen Street development. Victoria continues to remain in a strong position, which is reflected by our Melbourne team currently delivering over 100,000m² of commercial NLA in the Melbourne CBD. Projects include 80 Collins Street for QIC, 447 Collins Street (Collins Arch) for Cbus Property and ISPT, and 271 Spring Street for ISPT. New South Wales sentiment remains stable and our team continues to deliver a number of major residential and retail developments in Sydney including Galileo Group’s Arlington Grove and Palisade residences and the David Jones Elizabeth Street store redevelopment. 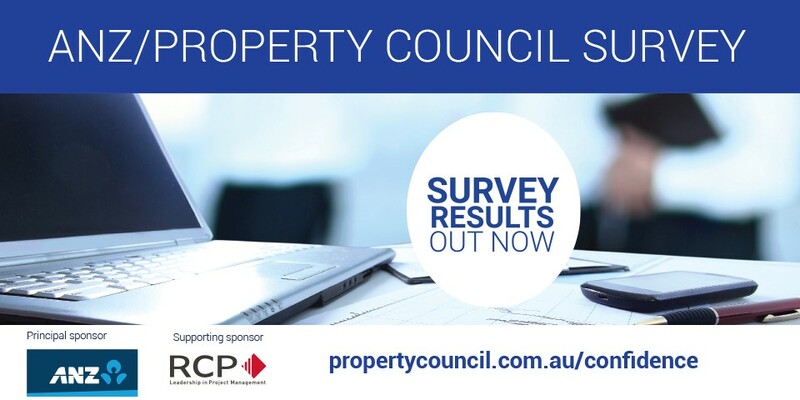 To view the latest survey results, please visit the Property Council of Australia website.